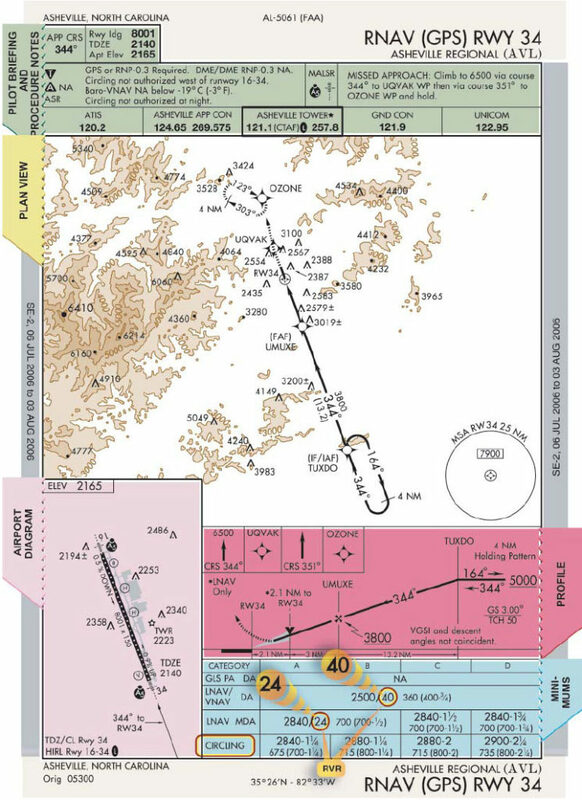 The minimums for straight-in and circling appear directly under each aircraft category. [Figure 1-19] When there is no solid division line between minimums for each category on the rows for straight-in or circling, the minimums apply to the two or more categories. The terms used to describe the minimum approach altitudes differ between precision and nonprecision approaches. Precision approaches use DH, which is referenced to the height above threshold elevation (HAT). 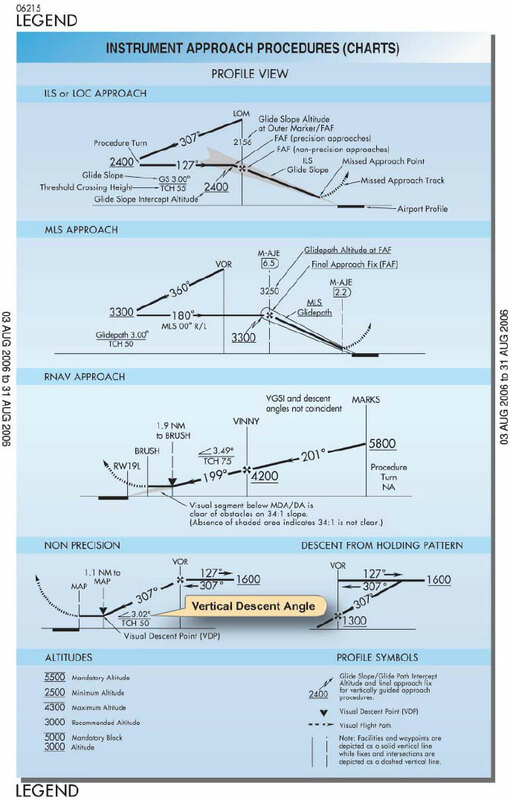 Nonprecision approaches use MDA, referenced to “feet MSL.” The MDA is also referenced to HAT for straight-in approaches, or height above airport (HAA) for circling approaches. 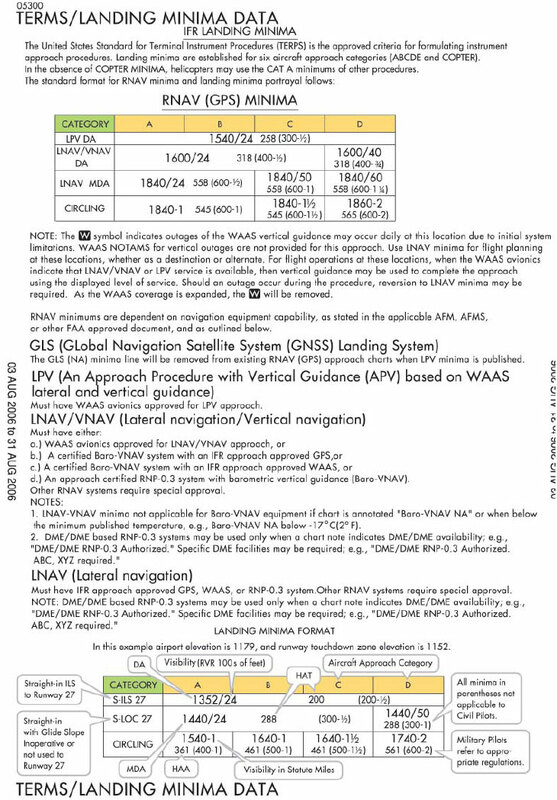 On AeroNav Products charts, the figures listed parenthetically are for military operations and are not used in civil aviation. 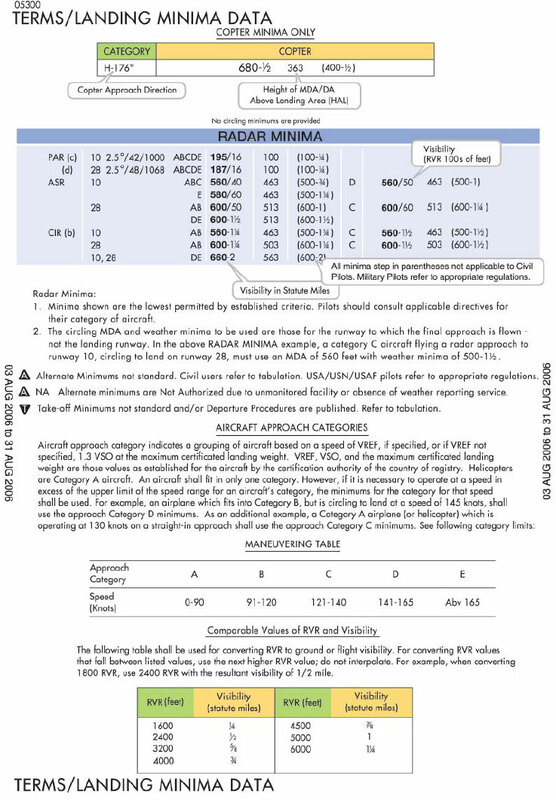 Visibility figures are depicted after the DA/DH or MDA in the minimums section. If visibility in statute miles is indicated, an altitude number, hyphen, and a whole or fractional number appear; for example, 530-1, which indicates “530 feet MSL” and 1 statute mile visibility. This is the descent minimum for the approach. The RVR value is separated from the minimum altitude with a slash, such as “1065/24,” which indicates 1,065 feet MSL and an RVR of 2,400 feet. If RVR is prescribed for the procedure, but not available, a conversion table is used to provide the equivalent visibility in this case, of ½ statute mile visibility. 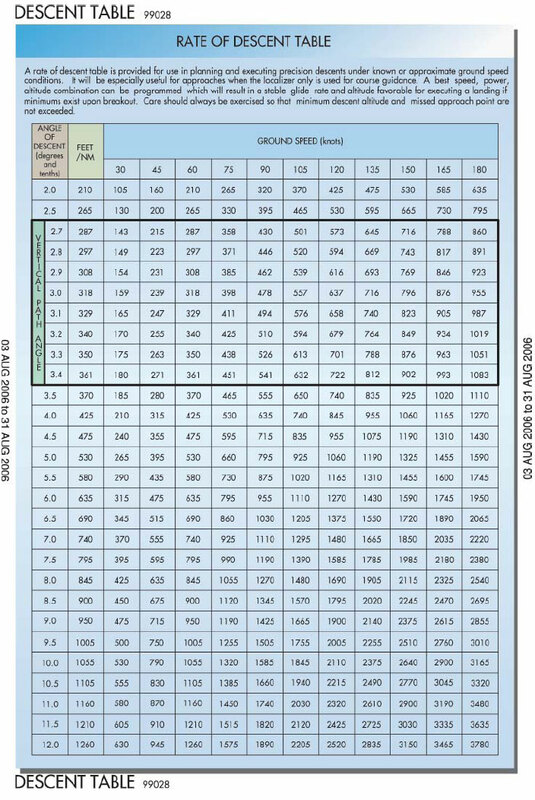 [Figure 1-20] The conversion table is also available in the TPP. When an alternate airport is required, standard IFR alternate minimums apply. For aircraft other than helicopters, precision approach procedures require a 600-feet ceiling and 2 statute miles visibility; nonprecision approaches require an 800-feet ceiling and 2 statute miles visibility. Helicopter alternate minimums are a ceiling that is 200 feet above the minimum for the approach to be flown and visibility of at least 1 statute mile, but not less than the minimum visibility for the approach to be flown. 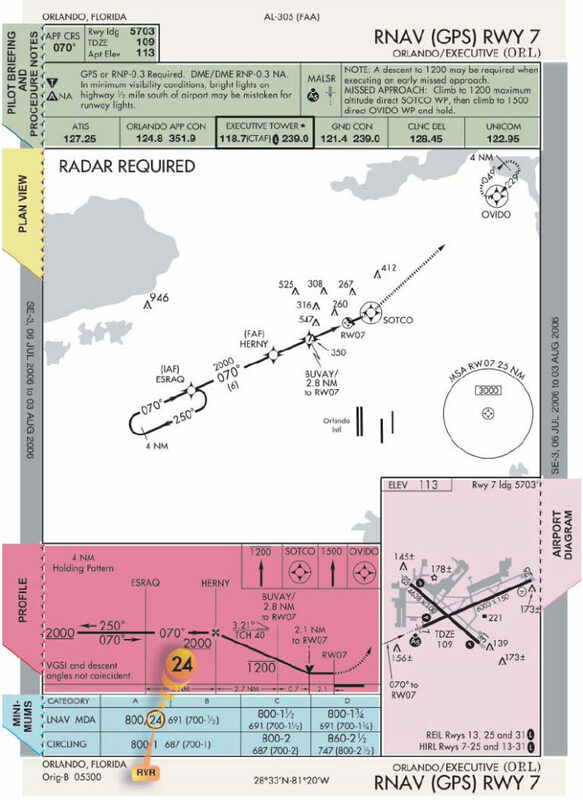 When a black triangle with a white “A” appears in the notes section of the pilot briefing, it indicates non-standard IFR alternate minimums exist for the airport. If an “NA” appears after the “A” (see below), then alternate minimums are not authorized. This information is found in the beginning of the TPP. In addition to the COPTER approaches, instrumentequipped helicopters may fly standard approach procedures. The required visibility minimum may be reduced to one-half the published visibility minimum for category A aircraft, but in no case may it be reduced to less than ¼ mile or 1,200 feet RVR. Two terms are specific to helicopters. Height above landing (HAL) means height above a designated helicopter landing area used for helicopter IAPs. “Point in space approach” refers to a helicopter IAP to a MAP more than 2,600 feet from an associated helicopter landing area.